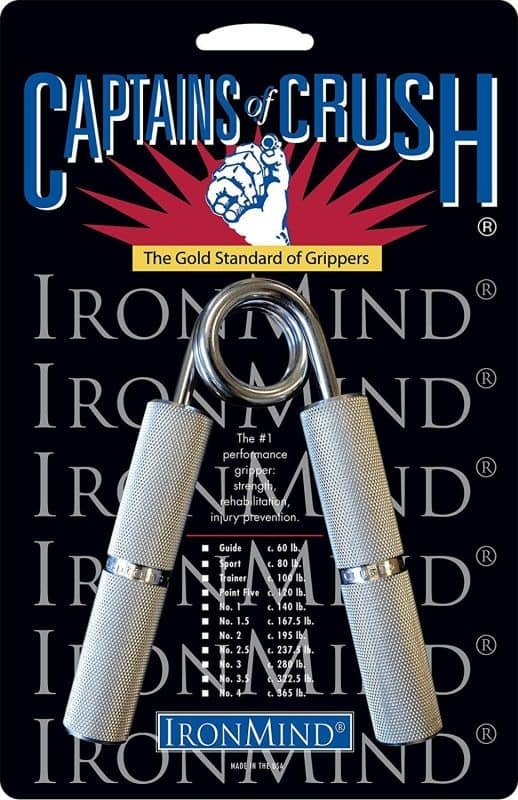 Quick Update: The best hand grip strengthener for most people is the Captains of Crush Hand Gripper. It is available in 11 different strengths ( From 60 to 325 lb. ) and is one of the best hand exerciser you can buy right now at an affordable price. It is versatile, durable, and consistent, and come with strong, steel bars as its handles. It also gets an excellent rating & user reviews overall. Made by an established company and the U.S. also has 11 different strength levels of grippers to allow you to work your way up the ladder when it comes to grip strength at many levels. The resistance level on then are fairly high with the lowest at 60 pounds, so it may not be suitable for absolute beginners. But, for those who are looking to build much stronger hand grip strength than the average person, this would be an appropriate product to use. In terms of getting an all-purpose strengthening workout, these are the ideal products. They rank among the best grip strengtheners there is because their strong resistance and durability can help even elite workout pros develop better and stronger hand grip. The grips are balanced to make users continue to rise up in resistance level of progression. Whether it is the “Sport” (80 pounds), the “Trainer” (100 pounds), or the numerical ones such as #1, #1.5, #2, etc., this grip set is much more than any of its kind found at a local sporting goods store. These are specific grip trainers that will help develop hand grip strength to well beyond the average human being. Usually, users have about three to five grips with different resistance levels at a minimum. Even better, it is still small enough to store in small places such as a car compartment, allowing to do your exercises in a myriad of places. In building the grip strength, this allows you to engage in many other push-and-pull activities more effectively. Because of its all-around functions, this ranks as the best hand strengthener on the market. This gripping set comes with some recommendations such as Climbing Magazine. It helps with finger strength, endurance, and finger dexterity which are needed when rock climbing. It is among the best hand grips on the market. These sets have four different color schemes that differentiate between the strength levels. Yellow has the lowest resistance at three pounds per fingers, blue is at five per finger, red is at seven, and black is at nine pounds per finger. Each of the sets comes with its own exercise program designed to help you ramp up your grip strength accordingly. 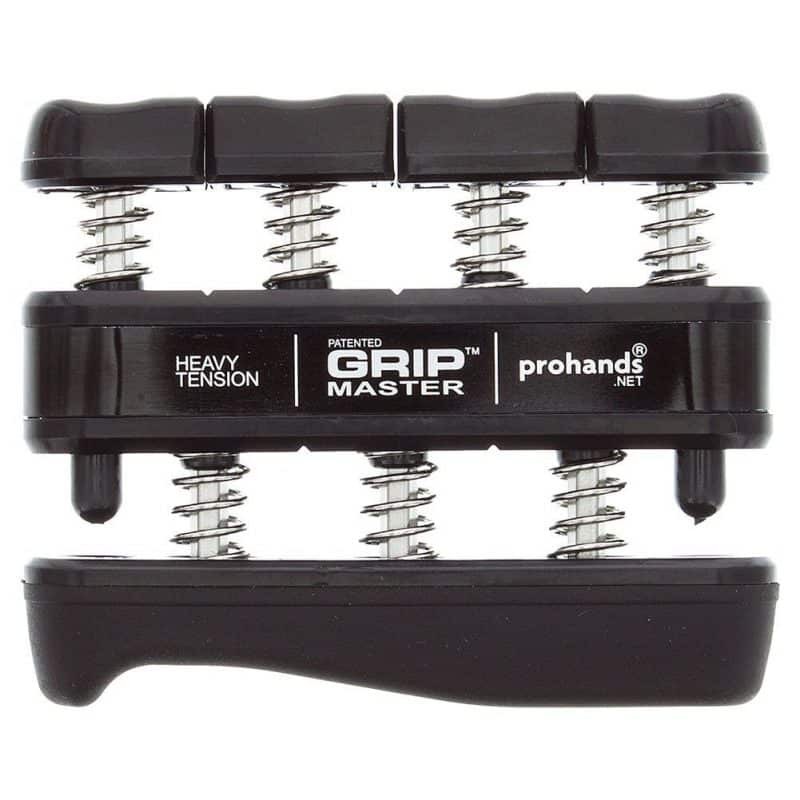 The resistance tension isn’t that great because the focus of these grip products mostly lies with the fingers. The forearms get worked to a degree, but the wrist not so much. However, many users note that it focuses particularly on the finger tips given its small size and the need to press buttons on it. Each of the exercisers is durable and well-constructed. However, some of the newer versions aren’t as large and don’t have as much padding. However, their small size makes it easy to pack them into a bag and carry around for use while traveling on the road. The design of this ACF product helps fit both large and small-sized hands. The resistance range of 22 to 88 pounds allows for lower-level workouts before gradually moving up to higher resistance levels. For athletes who are looking to keep their grips strong and consistent, this is a good product because it works out the forearm and wrists as well as the hand and fingers. For those who suffer from wrist and hand issues such as carpal tunnel syndrome or arthritis, the easy adjustment dial makes this a popular hand exerciser product. There are also eight different resistance levels, allowing for a wide range of choices that also allow a steady buildup when doing consistent workouts with it. The product is considered very durable due its steel spring, also very comfortable to use thanks to foam handles. It comes with a 100 percent lifetime guarantee. Those who suffer from sore wrists like this product because of the relatively low resistance setting. It is very adjustable and can help strengthen the area through exercise. Those who suffer from tennis elbow also gain its benefits from improving forearm muscle. This lessens stress on a person’s elbow. This is a piston button presser rather than a handle squeezer. The Finger Master product is versatile and can be used by a variety of subjects and can be for both adults and children. It has many different grips due to its strong adjustment level for each finger. This grip set is geared to those looking to strengthen fingers or is suffering from arthritis. By working out the fingers, it creates less tension on the wrist and other parts of the arm. The resistance levels range from three to 8.5 pounds per finger. The adjustment dials are located at the bottom of the tubes for easy access. This product also comes with a satisfaction guarantee or your money back. Despite its rubber use for comfort, it is made from a strong copper core. This supposedly allows for more durability. It is a small set, so you can easily pack it into a travel bag and take with you while on a vacation. Many users particularly like its size, but it is limited to mostly the fingers. The rest of the arm strengthening is due better finger flexibility. This piston presser also focuses on the fingers a bit, but can work on each finger individually as well. Thus, you can work on your index finger and your thumb separately if need be. There are four color-coded models which signify increased resistance levels. Blue is said to be at five-pound resistance per fingers followed by red at seven pounds. There are also nine pound and 11-pound edition. The increasing levels are designed to help gradually increase hand grip strength. It may not be designed for pure beginners given that five-pound resistance is its lowest level, but is sturdy. It may be as adjustable in terms of hand grips as other such models. This Sidewinder product is a heavy bar that is long and thick with two inches of steel for its diameter, making it very tough and durable. It serves as a wrist roller to help with its grip strength development. The resistance is built-in but adjustable. The tension gauge can create a resistance suitable for a young beginner or a workout professional. It helps strengthens forearms and hands as well as the wrists, providing more muscle and strength in those areas. The product features rubber grips which seem very durable according to users. There is also little to no noise when using this product. These ball products are used for squeezing exercises and comes in sets of three. While then can strengthen hand grip, they may also be used for tension relief. Its design is colorful and comes in an egg shape. The three balls actually have different resistance levels as the yellow-colored one has soft resistance, red is for medium, and blue is at the firm level. These may be good for kids to use at the beginning given their shape and color. While they have some strengthening aid to it, the main function is to help relieve tension in the hands and arms and allow joints to become more limber. There are numerous of benefits in doing regular and consistent hand-gripping exercises. The obvious one is increased hand strength. Grippers can be used to strengthen your fingers and wrists where your hand power originally generates from. Greater hand strength means more time hanging weights in the gym or performing better at climbing ropes where you are using your hands to lift yourself up. Another benefit is more endurance in your hands. You are applying pressure on the handles when doing such hand strength exercises. In time, you can develop better endurance by applying pressure for longer periods. This can help in everyday life such as carrying items around for longer periods or for lugging suitcases around an airport. More specifically, you are also using the fingers to squeeze down on the handles. This helps give the fingers a workout, creating more dexterity to them. If you are sitting in front of the keyboard all day, better finger dexterity helps your typing skills. Even though you are squeezing grippers with your hands, you are using muscles located in the forearm. These muscles are the ones that control the fingers. So the forearm flexors actually get a good workout and show increased muscularity through regular use of hand grippers. Stronger hands also mean less stress on the wrist which gets used much more in daily life than most people realize. Often the loss of hand strength is due to wrist weakness and such issues as carpal tunnel syndrome crop up because of irritation in the wrist tendons due to overuse. Hand grippers can help strengthen such tendons in addition to placing less reliance on the wrist due to increased head strength. Whether it is typing, moving, gardening, driving, or even holding a smartphone, hands are used every day and seemingly every minute of our lives. Over time, our hand strength can weaken with age. To combat it, people have been using the device known as hand grip strengtheners for the better part of a century. These tools sometimes referred to as simply grippers, are hand-held devices used to build strength in one’s hands. Grippers may have been around since the early part of the 20th century, but have evolved over time. Early versions were made of wood. 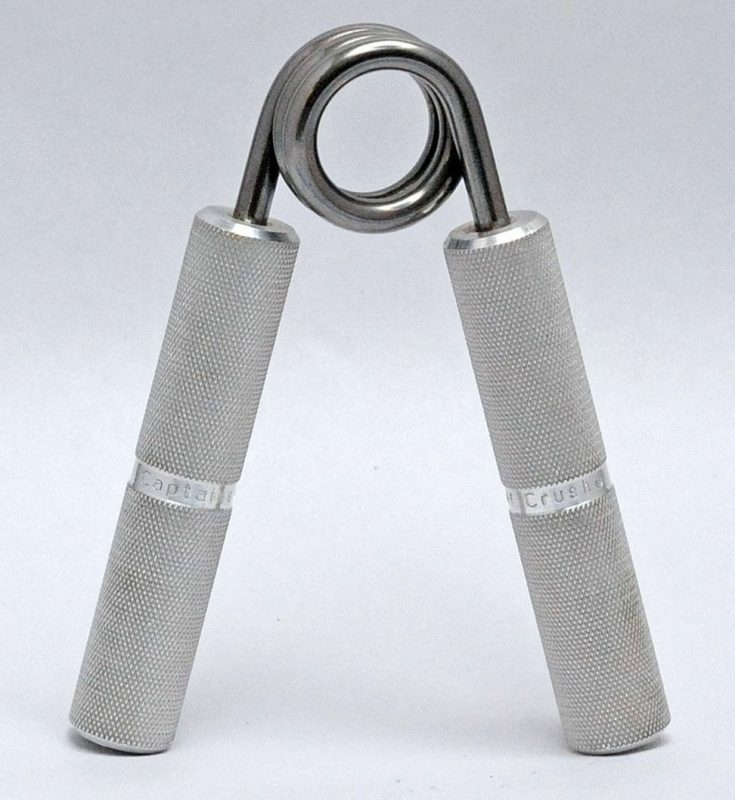 These days, they utilize torsion steel springs and a pair of handles to allow you to squeeze them together to help build grip strength through repetitive action and exercise. These days, grippers come in a variety of strength levels designed to help everyone from the newbie beginner to among the strongest men in the world. They have also grown to become increasingly complex, but that shouldn’t deter you from incorporating them into your exercise routine. Rather, it is just a matter of finding the right tool for you. Using hand grippers can help you become stronger at a body part which gets widely used all day. Thus, it can have great benefits that can lead to more exercise to better performance in outdoor and sporting activities. Grip strength can actually be divided into different areas. Depending on what function you are doing, there is crushing strength (when you squeeze something), pinching strength (when carrying items with one hand), grip strength (when holding or lifting an item), and support grip strength (when carrying something for an extended period of time). Hand gripper exercises can help with all of these strength areas. What to look for when buying a Gripper? When looking for the best grip strengtheners, you need to understand what the item is how one differs from the other. A big part of hand grippers are its resistance levels. This is a measurement in how many pounds of pressure must be applied to the grippers before they start to give. There are many different levels of resistance based on the level of strength of the user. The beginners may want to start with those found in sporting goods places that offer lower resistance in order to start building hand strength endurance. More advanced people who like lift weights will opt for a much higher resistance level. Many of the lower-level grippers usually have a resistance of around 30-40 pounds. Those at 60 pounds are more are usually reserved for those who want above-average hand strength and are more serious about gripping workouts. hand strength and are more serious about gripping workouts. Some of the grippers also can be set to different resistance levels, allowing you to ramp up your strength workouts accordingly. Durability and precision are also big factors to consider. You aren’t going to be using these tools just a few times. No, many of the grip strength exercises require many minutes of applied pressure or hundreds of squeezes on the handles at a time. A Guide on some of the top push up stand bars. 4 What to look for when buying a Gripper?